Construction Equipment Rental Market size was valued at over USD 100 billion in 2017 and will grow at a CAGR of over 4% from 2018 to 2024. Increasing number of construction activities coupled with the rising infrastructure investments will drive the construction equipment rental market growth over the forecast timeline. Various government institutions are stressing on refurbishing the existing infrastructure and undertaking new construction projects for the overall economic development of the region. For instance, huge infrastructure projects, such as the Comcast Technology Center in Philadelphia, the Stockholm Bypass Project, and London’s Crossrail Project, are expected to provide opportunities to the construction equipment rental market. Changing consumption patterns followed by the rising labor costs in countries including China are generating a high demand for renting equipment. The completion of construction projects in the stipulated time is compelling the organizations to rent equipment due to benefits offered such as reduction in maintenance and technical charges. Increasing number of fatal accidents during construction activities has forced organizations to replace the traditional construction techniques with machines. Regulatory authorities, such as OSHA, are regularly introducing regulations associated with the safety of workers and setting up protective workplace health & safety standards. The reluctance of traditional construction companies owning huge equipment fleet to adopt the trend of renting is anticipated to hinder the construction equipment rental market growth. The operations of rental firms are subjected to several laws governing environmental protection and occupational health & safety matters. Maintenance of operations across multiple locations exposes the players to several local and state regulations. Business operations are adversely affected followed by cost increase while complying with changes in laws & regulations, addressing the multiple aspects of operations such as consumer rights and worker safety across different jurisdictions. In addition, the lack of skilled workforce to operate advanced machinery coupled with the high unemployment rate in various economies still preferring human labor for construction are also expected to hinder the market growth. 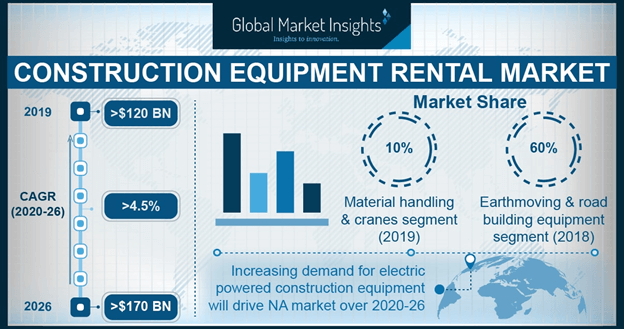 The construction equipment rental market for the material handling equipment is anticipated to witness growth at CAGR of over 5% owing to the rising accessibility for lease machinery. Organizations are focusing on using technologically-advanced material handling machinery to increase the throughput. Rising penetration of technologies, such as IoT, RFID, and GPS in material handling equipment, is a key factor driving the construction equipment rental market growth. Efficient storage & handling equipment, industrial trucks, and bulk material handling equipment are helping in the fast completion of the construction work thereby reducing the unnecessary time consumption caused by human involvement. The equipment also enables systematic storage of material. The availability of fully and semi-automated material handling equipment is expected to drive the industry growth. Asia Pacific construction equipment rental market is anticipated to witness growth to reach over USD 40 billion by 2024. The growth can be attributed to the escalating infrastructure reconstruction activities followed by heavy investments in the construction sector in regions such as China, India, and Japan. Rapid urbanization in emerging economies including India has fueled the construction industry in the region. In addition, extensively expanding road & rail infrastructure coupled with the increasing population generate a demand for house building in the residential construction sector, driving the construction equipment rental market growth. Several initiatives associated with the infrastructure development undertaken by various regional governments are propelling the demand for advanced machinery. For instance, the Government of India has announced the launch of major infrastructure projects such as Setu Bharatam project, Gujarat-Gorakhpur gas pipeline, Chardham Highway project, and Bharatmala project, which are expected to contribute to the construction equipment rental market growth. In addition, a Construction Productivity and Capability Fund (CPCF) was announced by The Building and Construction Authority (BCA) and Singapore is investing an amount of over USD 600 million as a part of the government’s attempt to boost the construction sector, which is also anticipated to drive the industry demand. 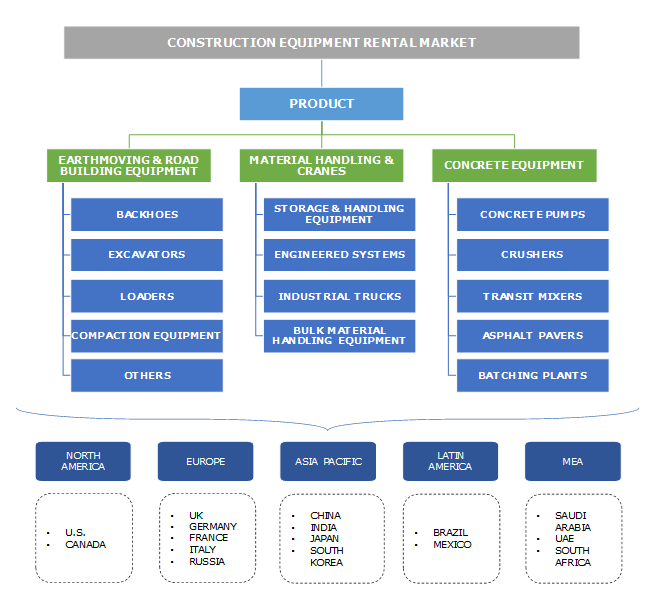 Key players in the construction equipment rental market include Ahern Rentals, Inc., Ashtead Group, Blueline Rental LLC, Cramo PLC, Loxam Group, Shanghai Hongxin Equipment Engineering Co., Ltd., Caterpillar, Inc., Herc Holdings, Riwal, Nesco Rentals, and United Rentals, Inc. The construction equipment rental market is highly fragmented owing to the presence of international as well as regional players operating in the industry. Major players are focusing on incorporating the latest technologies such as IoT, telematics that can scale with the business, enabling companies to be more agile and benefit from a high Return On Investment (ROI). The industry players are stressing on providing certified training and online courses for operators to ensure the safety of workers while operating potentially dangerous construction machinery. Small and independent businesses operating in the rental industry operate with one or two rental locations; regional competitors operate in one or more than one states. Public companies and the division of public companies operate on national as well as on an international basis. Anticipating the equipment demand in advance and optimizing the fleet utilization are some of the challenges faced by the rental industry operators. Making upfront capital investments in modern equipment and fleet expansion directly impact the cash flow of business operations. Increasing construction activities coupled with the rising government initiatives on infrastructure spending are boosting the construction equipment rental market growth. The integration of advanced technologies, such as telematics in machinery, has enabled the operators to further enhance the operations and reduce the overall expenses. Growing preference for renting equipment across the end users is providing an impetus to the industry demand. Businesses prefer renting the construction equipment than owning due to the various advantages offered by renting such as reduced costs associated with the operation, transportation, and servicing requirements. Renting construction equipment becomes a feasible option for businesses having budgetary constraints. Renting is also preferred by construction companies that require the equipment only for a specified time span. Enhanced maintenance services offered by rental companies is expected to propel the construction equipment rental market growth.